CHICAGO (WLS) -- A judge blocked a man from getting out of jail after he was charged in the shooting of an off-duty police officer. He is accused of shooting her in the leg with her own gun. Raphael Jordan, 48, was charged with attempted murder after last week's shooting in the city's South Shore neighborhood. The 37-year-old officer was working as a security guard for a construction company in the 2200-block of East 69th Street last Thursday. She had her CPD badge on her belt. Around 11:30 a.m., she saw Jordan walking away from the construction site with a hammer drill owned by the company, Assistant State's Attorney Barry Quinn said in court on Sunday. The state's attorney said the officer ordered him to stop, but he ignored her and dropped the hammer drill into a van owned by the dry cleaning company where Jordan works. Jordan got into the driver's seat after the officer identified herself. Quinn said a woman was sitting in the front passenger seat. The officer pulled out her gun and was standing next to the driver's side door when Jordan allegedly started to drive away. The state's attorney said she planted her feet on the van's floorboard, had her gun in her right hand and held onto the moving van with her left hand. Jordan "then attempted to throw the victim from the vehicle by driving up against four separate vehicles and erratically swerving form side to side," Quinn said. Jordan then crashed into a fifth car, allegedly grabbed her gun and shot her once. When she fell to the ground, the state's attorney said he drove away and left his cell phone on the pavement. The driver of the car Jordan crashed into called 911. She was taken to Northwestern Memorial Hospital in good condition. No one else was injured in the shooting. Witnesses said police responded to the scene quickly. "We seen the police officer picking up a lady off the ground. She received a gunshot wound to the leg," said William Calloway, a witness. "You could see the look on a lot of the officers' faces that they was real shook up because I'm sure that that was one of their colleagues that got shot." Jordan was arrested after police conducted a search warrant on his phone. 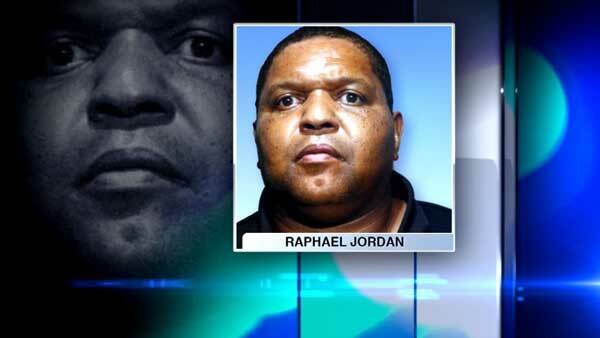 Jordan has several theft, robbery and drug convictions dating back to 1991. His public defender said Jordan is "vehemently denying" the state's attorney's version of events. Judge Adam D. Bourgeois Jr. cut him off, saying, "You pose a threat and danger to everyone." Jordan was held without bail.